Today at Chais Lund Curtains & Blinds we have increased our curtain and specialty blind fabric range. 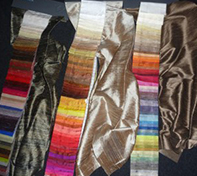 These include some very luxurious raw silks and a contemporary meets traditional collection all from Warwick fabrics. Also a very modern satin striped fabric from Charles Parsons. These fabrics will make some very stylish curtains in perth. Share the post "New Release Fabrics"